Prototype: French State Railways (SNCF) class 150 X heavy freight locomotive. Former German class 44. 1 Prussian design (Cs) crew car for the 2nd locomotive crew. The units look as they did around 1946. 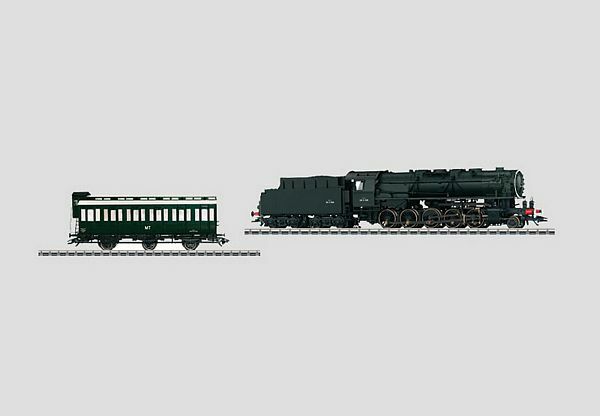 Model: The locomotive has an mfx digital decoder, controlled high-efficiency propulsion, a Telex coupler on the tender, and a sound effects circuit with many functions. 5 axles powered. Traction tires. The locomotive has an articulated frame to enable the unit to negotiate sharp curves. A 7226 smoke generator can be installed in the locomotive. The headlights will work in conventional operation and can be controlled digitally. There is an adjustable close coupling between the locomotive and the tender. There is an NEM-like coupler pocket on the front of the locomotive. Cylinder rod protection sleeves can be installed on the locomotive. Length over the buffers 26.0 mm / 26.2 cm / 10-1/4 / 10-5/16. The compartment car (crew car) has a brakeman's cab. The ladders and grab irons are separately applied. Length over the buffers 13.8 cm / 5-7/16. The French coal beds in Lorraine ensured the supply of energy for Paris for many years and particularly in the immediate postwar period. Very heavy coal trains went daily from the mines to the capital city. A second locomotive crew rode in a crew car specially set up for the purpose so that the relatively long route could be traversed as quickly as possible without long intermediate stops. The crew car for the second crew was a so-called camping car and the second crew could spell the first crew during the run. At the end of the Forties, the coal cars consisted of all kinds of different designs of two-axle gondolas. Cars with coal loads to go with this locomotive can be found under item no. 46092. This model can be found in a DC version in the Trix H0 assortment under item no. 22147.